Habitat: Upland. It grows on dry, sunny, rocky slopes and in grassy areas. Description: The flowers are up to 3 inches (8 cm) wide and have a band of yellowish white at the base of the pink tepals. 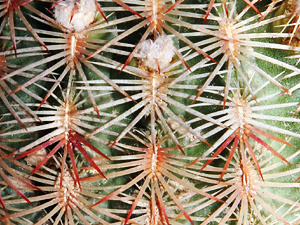 The stems are spiny, usually solitary, and green in color, but usually almost completely obscured by the dense spines. The spines are comblike, all radial (no projecting spines), and are held flat to the stems in rainbow-like alternating bands of pink and white. 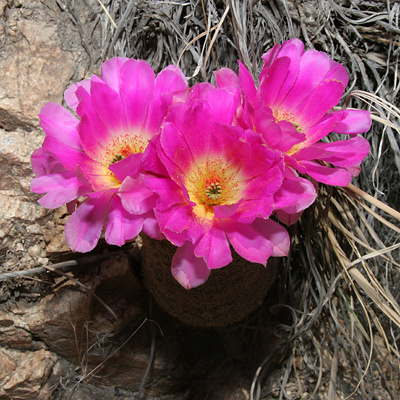 The similar Rainbow Cactus (Echinocereus pectinatus) has a band of green below the white band at the base of the flower tepals.